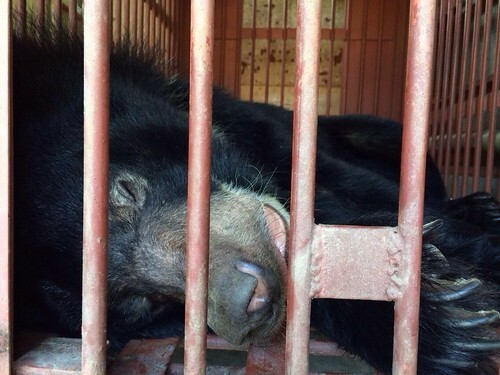 The rescue of Ti Map, the last bile farm bear in Binh Thuan province, Vietnam, was held up yesterday when he twice stopped breathing after being anaesthetised. 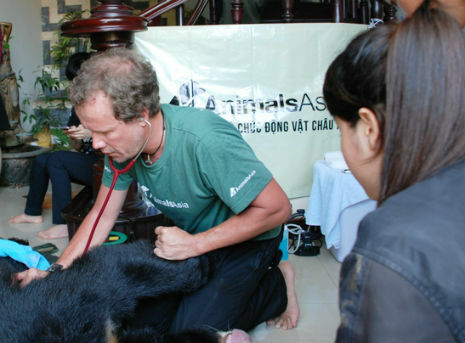 After receiving an initial dose of anaesthetic, Ti Map went under far more quickly than is typical for moon bears and stopped breathing before being resuscitated by Animals Asia’s Senior Vet Joost Philippa. Once resuscitated he was then due to be moved from fourth floor to first but stopped breathing again midway. Once again Joost’s quick actions saved the bear. Ti Map was originally due to receive a full health check on the bottom floor. However, the decision was taken to medically reverse the anaesthestic to avoid any further risks to Ti Map’s health. With the possibility of the anaesthetic wearing off safety concerns for bear, vets, local media and authorities in attendance, meant the health check was abandoned. Instead Ti Map was loaded directly onto the truck which will take him on a 1,700km journey back to Animals Asia’s Vietnam Bear Rescue Centre in Tam Dao, north of Hanoi. 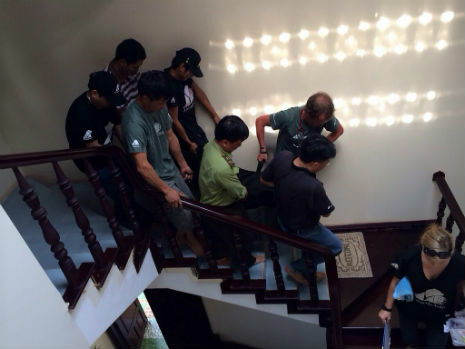 Due to the health scare, the convoy’s departure from Phan Thiet was delayed causing them to abandon plans to make it to Tuy Hoa on the first leg of the journey. Instead, Ti Map and the Animals Asia team spent the night 150 kilometres away in Phan Rang. During the journey the team will also have to contend with the possibility that Ti Map’s adverse reaction could be symptomatic of underlying health problems. While it proved impossible to perform a full health check, cursory analysis showed Ti Map’s paws to be in poor condition having spent 14 years on metal bars. His pads are extremely dry as is typical of former bile farm bears and his teeth are also in poor condition probably due to bad diet and bar biting. Day two of the rescue continues, follow it live here.